You’ve no doubt seen the headlines filtering in: ‘Is Sitting the New Smoking?’, ‘Sitting for 8 Hours a Day Leads to Increased Risk of Disease’… the list goes on. Office-based employees can spend up to three-quarters of their day sat down. This can contribute to a range of preventable health conditions, including the two leading causes of workplace absence: back injuries and stress, depression or anxiety. In 2017/18, 1.4 million UK workers suffered from a work-related illness. Estimates show that absences can cost businesses approximately £554 per employee. Helping your staff stay physically active at work can benefit their health, but also your business overall, improving motivation and productivity and reducing the risk of work-related health complaints. We’ve put together some inexpensive and easy-to-implement tips for you to help keep your people moving. A great way to get everyone moving is to encourage walking and running clubs. If people sign up to a local 5 or 10k race, training on lunch or straight after work is the perfect combination of movement and socialising. If you’re not much of a runner, why not try the 10,000 steps challenge? Lunchtime walking groups help people reach the recommend 10,000 steps a day and keeps everyone moving in the process. For those that prefer classes and equipment, you can negotiate corporate discounts at local gyms. Plenty of gyms offer half hour classes around lunchtime, which is the perfect way to build some fun physical activity into your day. Yoga is the perfect way for people to work on their posture and flexibility while also relieving some stress. Teachers can come into the office to teach a regular weekly class at lunchtime. Alternatively, you can get membership to ‘online studios’ which are inexpensive and give access to many different classes online. Research suggests that standing at a desk for a couple of hours a day – instead of sitting – can help people burn calories, increase focus and prevent potential diseases and chronic complaints. While it’s a bigger investment, sit-stand desks can help people spend more time on their feet. 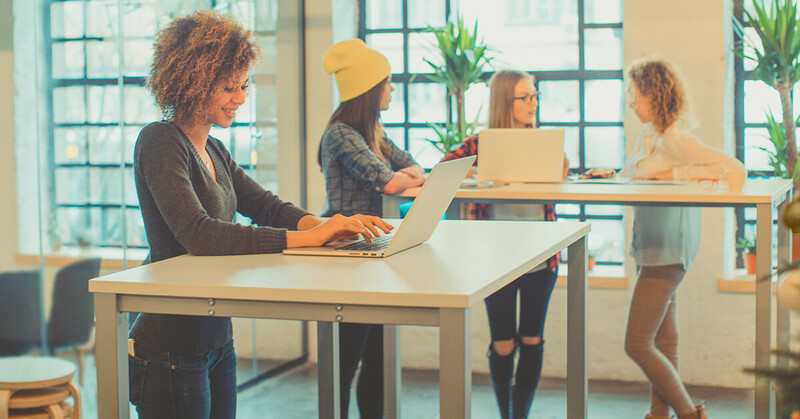 Desks can move up and down to accommodate both sitting and standing, with some research showing that sit-stand desks can help people spend 83 minutes more on their feet per day, on average. Breaks and lunchtimes don’t have to be spent with your feet up. If your office has the space, why not install a table tennis or pool table? That way, people can have fun, mingle and increase their daily activity without even noticing. And for those with a competitive streak, you can even set up a league or tournament. Plus, if you provide recreational facilities for your employees to use that meet certain criteria, it’s not considered a taxable benefit in kind. That means no tax or National Insurance contributions are charged to you and you don’t need to report this to HMRC. Got a meeting scheduled? Instead of sitting in the office or a meeting room, try taking your meeting outside, get some extra steps and a healthy dose of Vitamin D while you’re at it. You can take it a step further and allocate a particular day where all internal emails are forbidden, and employees have to get out of their seats and talk to each other. That way you keep people moving and create a great communication culture! Introduced in 1999, the cycle to work scheme allows employers to buy bikes and lease them to their employees. Employers then recover the cost of the bike through a salary sacrifice scheme, which means employees save on tax contributions. Cycling is a brilliant way to get moving, especially as cycling to work is a daily activity. Some studies have even shown that cycling regularly can cut instances of heart disease by 46%. Whether you’re considering introducing new ergonomic chairs, a health and wellbeing initiative in the office or you just need help reducing sickness and absence rates, our specialists have all the expertise your business needs to excel. To see how we could start supporting you today, contact the team using the form on this page. And if you’re a client, remember, we’re here for you day and night with our 24/7 advice line.